Marian College in Ararat, is a Brigidine sponsored Year 7-12 Catholic co-educational college that is nestled in the foothills of the beautiful Grampians National Park in Ararat. Established by the Brigidine Sisters in 1888, Marian College has a very long and proud history of serving the parishes of Ararat, Stawell and Beaufort. The Brigidine sisters still own and operate the school and have a presence on staff and through the Stewardship Council. As a community we are very proud of our school and its Brigidine identity and ethos developed so strongly over the years. We have a dedicated team of teachers who always strive to provide the best possible learning outcomes and co-curricular opportunities for our students. The College is a progressive leader in the pastoral care of our students, with the Teacher Advisor (TA) Program operating throughout Years 7-12. Every new Marian College student is placed with a teacher (their TA Teacher) who will have a crucial role in guiding them through the next six years of secondary schooling, both academically and socially. The TA Teacher also plays a vital role in developing strong links with the parents of their students to ensure that any concerns or issues are dealt with quickly and with great care. The TA Teacher becomes an advocate and role model in the lives of the students in their group. Each TA Group is a member of one of four Houses: Clancy, Synnott, Barron and Kelly. All sporting events and many extra- curricula activities are organised according to Houses. 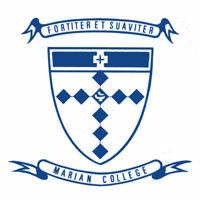 Over the past year, Marian College has undergone a series of major refurbishments. The College has recently opened the Sr. John Spurr Multi-Purpose Centre/Gymnasium. At a cost of 2.6 million, this facility is a state-of-the art sports and learning centre. Similarly, a 1.2 million Trade Training Centre has recently been completed offering university standard facilities to our students in the areas of Laboratory Skills and Food and Wine Processing.